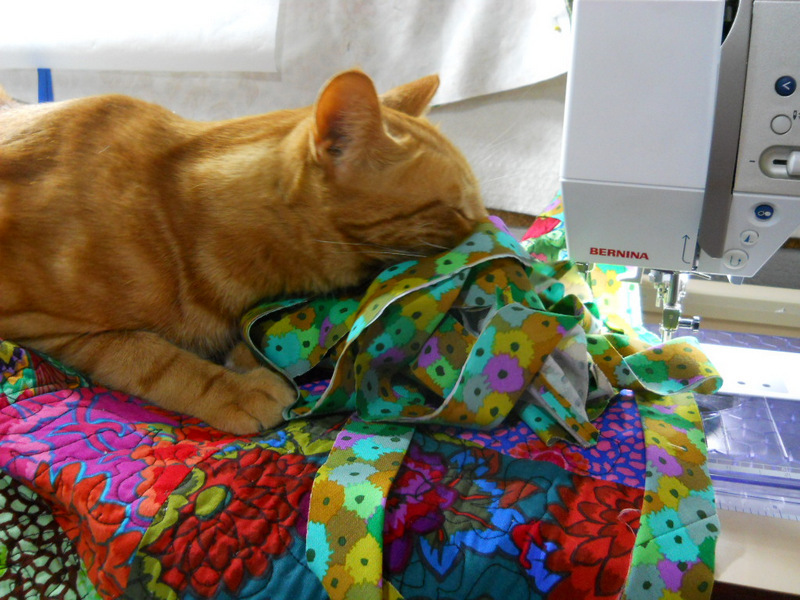 Your kitties and your quilts are both pretty. Great minds think alike- I love the smell of new fabric! Your babaies remind me of my cats Liffey and Bear, both of whom now reside with my in laws. The quilts are great too- love the bright colors- set off the felines wonderfully! And what has MoMo done to be given the name "the Terrible"? Mina, Moe Moe is my little serial killer. He is all grown up now and is a champion hunter. I have seen him catch a bat in mid air. Thankfully I rescued it. Those are all great pics of beautiful cats, but I have to say that one of Moe Moe the Terrible made me laugh out loud. What a cutie. 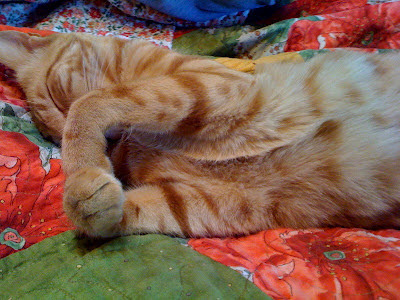 I love your orange cat - the picture of Alex makes me smile- Mars used to try and help me sew too- not so much any more. I love the one in the basket. So cute! Gorgeous quilts, and beautiful kitties! I'm so glad that you are part of the show! Thanks for sharing your lovely helpers with us. Love all your tabby sweeties! You have some really hardworking helpers. Looks like they do an exhausting job making sure your quilts are cozy/comfy. Very cute post/entry to the Pets on Quilts Show. They're all adorable! And they sure make your quilts look comfy. These are some sweeties! What a group! Moe Moe reminds me so of my Mia and Mimi...they have already put in their requests to be my featured entries for next year...of course they have to get in line with Marvin and Jaxson and Tippy and Willy..and the list goes on. So wonderful to see another house full of furry love! They are all so cute. I especially like the last photo! Lovely pictures of your beautiful cats. Love the fabric smelling pic! Too cute. Makes me want to go home and snuggle with mine - whether she likes it or not! Thanks for sharing - good luck!!! You cats are experts at cat quilt work. I need to take lessons! You're right, that is a beautiful picture of Sammie. And love the one of Alex buried in the fabric. There are some lovely pictures there, thank you. I want to take Mo MO home with me!!!! I am in love with momo! The other kitties are cute but oh, Momo has that look I just love in a cat. I love your photos. Thanks so much for sharing. what adorable little fur balls.